Pictured: Two pastors – one from Moscow and one from Novomoskovsk. One who is Russian and one who originally came from Africa to study electrical engineering and stayed to pastor and plant churches. Both leaders in different unions (networks of churches) sharing fellowship with Ralph late one night in Russia. God is bringing together different streams of His Church with one common goal – planting churches where there is no witness for the Gospel. In some areas of the world a new church is being planted very hour of every day. In other areas it is even happening faster than that. And, leaders are designing their lifestyles around the fact that they want to move out and plant new churches. Their work, their family, their involvements are all geared around the one vision and one goal of seeing the lost saved and churches planted to nurture and raise up the new believers. But, they are also wanting to see each new church plant another church (a sister church) within the first year of their existence. And then, at least one more new church plant each year after that. Disciples winning people to the Lord and churches planting churches – a definite winning combination. This is all they talk about, dream about, plan for, and live for. It is the focus of literally every conversation and they will not be sidetracked into doing other things. They want to see the lost saved and churches planted and growing. They are investing their lives in this – it consumes them. For the past five years I have wanted to be planting a new church. I have prayed and planned. I have talked and shared my vision. I have sought finances for this outreach. I have invited other church leaders and churches – both those in the Network I belong to and others – to join with me and see what the Lord could accomplish as we reached out together to the lost and planted churches in our cities and larger towns. No real response and even less excitement. Maybe it wasn’t time for such a vision. Maybe I presented the vision poorly. Maybe I came on too strong. I don’t know. But I do know it is time now to become very serious about winning the lost and planting new churches; training and raising up new leaders for these new churches; and simply praying and planning to take our cities for Jesus. I am involved in doing just this overseas in a number of nations – including learning from some leaders who are certainly actively involved in doing just this and doing it very, very well. I will invest my life, my time, and my money in people who are hungry to see God’s purpose fulfilled and who are willing to live in such a way – even sacrificially – so as to establish the Kingdom of Light where there is currently only darkness. I would love to hear from others who might want to pursue God’s agenda no matter where in the world you live. Together with Him we can do it! I am on my way home – that really sounds good. It has been a wonderful and marvellous two weeks of apostolic ministry – a week in the nation of Moldova and a week in the awesome nation of Russia. But it is good to be heading home. Please pray for good weather, safe travel, and all connections to be made as I switch planes several times on my way home. I really appreciate you partnering with me in this work for the Lord. Your prayers and financial support are really appreciated. This mid-day blog on the trip will now come to an end as this is my last full day on the road. However, your prayers are still something I treasure as I prepare for a mid-February trip into the United States to minister – a two day youth conference, a Sunday in a local church and a mid-week service in a local church as well as a three day Apostolic Roundtable meeting. As well, I am preparing for a trip to Kazakhstan in March. Blogs on these trips will appear as I leave to go to these ministry opportunities. PICTURE: Team members prophesying over someone in one of our many services. The team included new members who had never done this in public before. God blessed their stepping out in faith. It is now the end of the first month of this new year. Time is moving quickly. Maybe it is not moving quickly – maybe I am just moving somewhat slower so it seems to be going by me rather rapidly. But time is moving on – quickly or otherwise and you and I will be held accountable for this year that the Lord has given to us. This life is not a dress rehearsal; you don’t get to be recycled and do it all a second time only better. You only pass this way once. What are you doing of spiritual significance as you walk through each day of this year? What has changed from last year? Is it a good change or a negative one heading you in the wrong direction? God is going to hold us accountable for what we do in 2012 for Him. He will also hold us accountable for what we don’t do that He has asked or commanded us to do. You know, go out and seek and save the lost; as you go through your regular life make disciples; things like that (you will find many such commands in the Bible). He wants 2012 to be a year of change, of growth, of progress, of maturity. He is looking for us to become more fruitful, seeing people born again and entering into His Kingdom purposes. He is looking to see His Church and thus His Kingdom grow and multiply upon the earth. He wants to see more churches planted and more believers discipled, trained and equipped for the work of the ministry. And, believe me, He is very serious about all of this. So, if you are not moving forward in your walk with the Lord – time to make some changes, no matter how painful or costly. If you are not giving away what you have received – discipling others who are younger in the faith – time to make some changes. If you are not seeking out and finding more mature believers to help disciple and mentor you – time to make some changes. And, if your church is not… time to make some changes. In every nation I hear God saying prophetically – it is time, it is time, it is time! It is time to become more serious about the purpose of God; it is time to let go, pay the cost and move forward in Him; it is time to make some foundational life changes that will facilitate you walking in His will and impacting others for Him (Jesus). It is time to win the lost, plant new churches and take our cities and districts for Jesus. It is time! PICTURES: People at a five day seminar on the prophetic listening intently and then practicing hearing God for one another – growing and moving forward in spite of the building being only slightly warmer than outside (and it was held in January). And they paid a sizable fee for this seminar that would have been a serious sacrifice for everyone … but they paid because they want to grow and fulfill God’s plan and purpose for their life and for the churches they belong to. http://ralphhoweministries.com/wp-content/uploads/2017/08/ralph-howe-ministries1.png 0 0 ralph http://ralphhoweministries.com/wp-content/uploads/2017/08/ralph-howe-ministries1.png ralph2012-01-30 00:05:562012-01-30 00:05:56Moving On! I am on my final day of ministry for this trip – other than time talking to others about Jesus on the various planes and airports on my way home on Monday. It is Sunday here and the day is just coming to an end as you receive this blog. We are ten hours ahead of Central Canada and the USA. I ministered today in Power Source Church in the city of Novomoscovsk (New Moscow) and God was, as always, gracious to us and powerful. I gave my testimony in the morning service and did just a little prophetic ministry. Then, in the afternoon, as we wrapped up a five day prophetic conference, I taught for just a few minutes and spent several hours ministering prophetically. The people, as always over here, are hungry to hear from God and to know more about His will and His plans and purpose for their lives. Then we drove for 3 hours into the city of Moscow and a very small hotel (8 rooms) where we have stayed before. It is close to the airport and they have a van that runs us into the airport in the morning. We usually come in to Moscow late at night as there is less traffic – although still substantial. It also shortens the first of two travel days as you get the driving done the night before the first flight. Please be in prayer for Monday and Tuesday – I leave for one of the four Moscow airports at 6:30a on Monday… arrive home on Tuesday afternoon body time and Monday night local time. It is about 30 hours of airports and planes… Please pray for good weather, connecting flights and no issues with security, breakdown of planes, delays, and all the other things that interfer with getting home on time. Greatly appreciated. As a disciple of the Lord I believe that I need to be discipling others who are younger in the Lord than I am. I believe that this is my task as a believer and not just as a pastor or apostle. I believe every believer must – in fact, is commanded – to disciple others who are just beginning their walk with the Lord or, at least, are not as mature as you are. Every disciple needs to be discipling; every Paul needs a Timothy; every father needs a son in the Lord to disciple. In the pictures attached to this blog is a young man called Daniel. He received a prophetic word at a public meeting in the city of Moscow in November of last year. He instantly rearranged his life to move forward in the Lord as a believer and in his calling as an apostle-in-training. He did some practical things like setting up an email account so he and I could communicate with one another. He did some spiritual things to kick-start his spiritual life and become more serious about the Lord. He is hungry and he is chasing after more – and relating to me to receive more. In fact, he even travels to where I am ministering to learn directly and personally from me. Recently he found a way to get from the city of Moscow to the city of Novomoskovsk (a 3 hour drive) just to spend two days at a training seminar for the prophetic that I was holding in Power Source Church. He took notes on his tablet, he prayed, he practiced all the exercises we did, he attended the leaders meetings in the afternoon, and he came forward to prophesy publicly when given the opportunity. He is hungry to grow, move forward, mature and become a powerful (and young) apostle in the Lord Jesus Christ. I also believe that every mature believer needs to find people to disciple them and mentor them in areas where they need to develop further… Three years ago I lost a long-term mentor because he went to be with the Lord. It took me a year but I found another who is actually a bit younger than I am but who is much more experienced and mature in his calling as an apostle. He has agreed to mentor me and I now see him three to four times a year at my expense. This means I fly, pay for hotels and meals, and spend time with him. I go prepared to ask questions (I always have a long list) and to listen. Not to argue, debate, or show him how much I know. I simply humbly sit with him and let him speak into my life and ministry … and throughout the time with him (averages five days each visit now) ask my questions when the time is right (usually as we are driving somewhere). God wants each of us to be discipling someone younger in the faith and He wants each of us to seek out and find others who can disciple and mentor us. Both are necessary. We will be challenged to grow as those younger in the faith ask penetrating questions and you are forced to think through many things you have simply taken for granted so that you can answer the questions. And, as someone wiser and more mature in his walk with us helps us to mature we will also grow because of their challenge to us to become all that God wants us to be. My question: Who are you mentoring – who have you sought out and invited to be your disciple? My second question: Who have you sought out and asked to mentor you – even if it costs you time and money? The answer to those two questions will determine how mature you will be as a disciple and how successful you will be in fulfilling your destiny in the Lord Jesus – His plans and purpose for your life. http://ralphhoweministries.com/wp-content/uploads/2017/08/ralph-howe-ministries1.png 0 0 ralph http://ralphhoweministries.com/wp-content/uploads/2017/08/ralph-howe-ministries1.png ralph2012-01-29 00:05:162012-01-29 00:05:16Time to Grow Up! This is Edic (Edward) and he is a believer and could care less that the building he is worshipping in is uncomfortably cold. And, it is because I am working in this building right now and preach with my coat on as well. I expect at any time to see my breath it is that cold in the auditorium. There are over 100 people each day listening and learning; practicing and flowing in the prophetic. The testimonies today were great and very encouraging about how God is using what they are learning and how they are applying it to their lives and witnessing. Edic left early last night and came back with two friends who are not saved. He was hoping they would be impacted by the prophetic ministry and maybe even get a word from the Lord. I could see that they were watching carefully and the Lord showed me they were not born again but did not lead any of the team members to give them a Word of the Lord. Edic was not disappointed – only glad that they came and were influenced by what they saw and heard. He hopes they will be back tonight. I hope so too and will certainly prophesy over them if they are. He is so hungry to see his friends come to know Jesus as the Lord means everything to this young man. So good to see. Please pray for the young men attending the services we are holding. Many are from a number of nations around the world and are here studying at the university. They are seriously saved and want a Word from the Lord about what to do when they graduate and where to go so that they can influence people to accept Jesus and be saved. These guys are missionaries in the waiting… and God is touching some of them each night. Last night we prayed for the student who is top in his class and heading the France to do a doctorate degree – powerful word. We want to impact as many of these international students as possible. No wonder this church we are working with is called “Power Source Church.” Please pray. Thanks! I recently worked with a group of leaders who planted a church in a main city and have worked hard to see the lost won to Jesus. They have had their ups and downs and seen people come and go. Several times disgruntled leaders took a sizable group out with them when they left and rebuilding was once again necessary. But they are such soul winners that they have a Sunday assembly of just about 500 people at the present time. Their leadership is dedicated to soul winning and seeing people saved, discipled, equipped and released into ministry so that others can come to know the Lord. They are single-focused. When you sit with them they talk about Jesus and the lost. When you drive somewhere with them they talk about Jesus and the lost. When you pray with them the topic is Jesus and the lost. At meal time the topic is Jesus and the lost. It is an amazing group. They are so convinced that Jesus is Lord and the only way to Heaven that they have dedicated their lives to sharing this good news. They plan their lives around this vision and passion. They have planted 11 other churches in their region since they began 12 years ago. People have been trained and then moved out to these cities and towns. There they have found work, built relationships, and began to see people saved. A small house church was formed and more people were won to the Lord and so a public worship service was begun and a new church birthed. Some have their own buildings (most badly in need of repair still) and some rent facilities. In North American terms they are very inadequate and often cold and sometimes dangerous. But, it does not bother them as they love the Lord and are seeing the lost saved weekly. There is much to celebrate and still much to do. I worked in the mother church and 4 of the 11 “church plants” and I was seriously impressed with each and every church and leader I worked with and came to know. I am amazed at their willingness to sacrifice to see others come to know the Lord. Being trained, moving to another location, resettling their families, having two jobs when the church is starting, working with inadequate facilities, fighting the governmental structures, and simply doing what needs to be done … I was and am impressed. Oh, did I mention that they have also planted 2 other churches in neighboring countries learning the language and doing whatever else is needed to be done. And they have plans to move three couples into those countries this year to begin three more church plants … with plans to expand next into Turkey and then to the ends of the earth. It is refreshing to know these men and women and to be a part of what they are doing and their plans to see the whole world come to know Jesus. As a leader in a network of churches where few are being saved and new church plants are almost nil (1 in the last 10 years) I wondered what they have that we don’t. It did not take more than a few hours with them to discover the answer. http://ralphhoweministries.com/wp-content/uploads/2017/08/ralph-howe-ministries1.png 0 0 ralph http://ralphhoweministries.com/wp-content/uploads/2017/08/ralph-howe-ministries1.png ralph2012-01-28 00:05:572012-01-28 00:05:57Should We Be Ashamed? I am still ministering in the city of Novomoskovsk, Russia. In the morning today I met with a leader from a church about 90 minutes from here whom I mentor regularly by Skype and in whose church I have had the honor of ministering. We spent the whole morning together and it was a good time to connect and grow in our relationship together. This afternoon I will be ministering in a packed room to about 50 leaders (really packed out room) and we will be talking about leadership issues and working on how to evangelize supernaturally and see God’s plan and purpose carried out effectively in today’s world in Russia. Then tonight a public service. The building we are holding the evening services in is really cold and so most keep hats and scarfs and coats on during the service. It is cold I will admit but it does not seem to bother the people and it certainly does not bother God. We minister from 6:00p to 9:00p+ and everyone stays. Each day is slightly different but the anointing is the same and it is strong. The hunger for more of God is certainly seen and felt and people are simply enjoying God’s presence, the teaching of God’s Word, each other’s fellowship, as well as being equipped in some new areas to fulfill God’s plan and purpose in this city. Picture: Daniel from Moscow in the leadership session (a warmer room with electric heaters) – one of Ralph’s disciples whom he is training to be an apostle. Many of the youth use tables or iPads and go without so much just to invest in one or to make monthly payments. They want to be in touch with the world and do their studies and research electronically. Please pray for my team – they have come in from Moscow and Tula (cities within 3 hours of here) and several smaller centers and we are beginning to pick up the pace prophetically now we have more workers to handle the demand. We are getting to know each other and beginning to partner together in this ministry. Often they start as total strangers… Thanks for praying. Have you ever seen the guy with the sign that says “Repent for the end is near?” Or seen a sign on the front lawn of a church saying the same? There are many in my nation and in several of the nations where I minister regularly. They are a really strange mixture of wrong theology and a totally screwed up understanding of what God was and is doing. Jesus came and preached “The time is fulfilled, and the kingdom of God has come near; repent, and believe the good news.” (Mark 1:15 NRSV). Jesus did not say repent for you are about to die and need to get things right before hopefully going to Heaven. He said to repent because the kingdom, the Way, the rule of God is near and right here and now – available to all who want it. 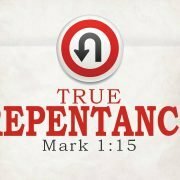 He said that repentance was the way to enter into the Kingdom and become involved in this new world order and everything that Jesus was planning to do. Jesus was inviting people to leave their self-centered way of thinking (repent means to change the way you think) and their egocentric approach to life and join with Him in a partnership to help bring about His way of love and life in this world. In other words, I repent not because the end is near, but because the beginning is here, and I want to be a part of it. Christ’s message of the Kingdom and of our response of repentance was not just a command to regret our past, but an invitation to help bring about a new future. Become involved today! To “repent” means to have a change of heart resulting in a change of mind; to look at things from a new point of view; to think about things differently; to change your current course in light of the new perspective.